Right in the centre of town you can find a rickety old house, full of character and 16th Century charm which just happens to be the place Shakespeare is believed to have been born. This is a great place to start on tour of Shakespeare’s life and incredible achievements. As well as taking in the atmosphere that shaped Shakespeare’s early years, your visit will offer the opportunity to find out how other famous writers including Dickens, Hardy and Keats reacted when they visited the building. Shakespeare’s birthplace also has its very own troupe of professional actors who will act out sections of Shakespeare’s plays on request – so line up your favourite scenes or see if you can catch them out with an obscure request. A trip to the RSC theatre is an absolute must when you are taking in the sights and sounds of Shakespeare country. This is where you can see some of the best Shakespeare you’ll experience in your life, and you may even get the chance to see some of Britain’s most well respected actors tackling parts such as Macbeth, King Lear and Romeo and Juliet. Past performers in Stratford include Judi Dench, Tim Curry, David Tenant, Mia Farrow and many more. winter 2013 season at the RSC you can see plays including Antony and Cleopatra, Richard II and The Taming of the Shrew. These performances are well worth a trip to Stratford upon Avon in their own right so be sure to catch a show while you are in town. Anne Hathaway was Shakespeare’s wife and an important part of his life and history. You can access Anne Hathaway’s Cottage and Gardens by walking the beautiful footpath running from central Stratford to the hamlet of Shottery where the cottage is located. Once you arrive you can enjoy the gardens, take a tour of the building and even take a walk through the woods to the sound of an original musical composition inspired by Shakespeare and written especially for the trail. 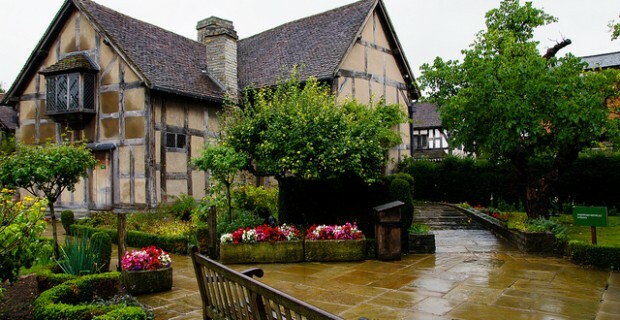 Anne Hathaway’s cottage is a great place to take a family, and it offers a tranquil escape from the centre of town for any visitors to the area. 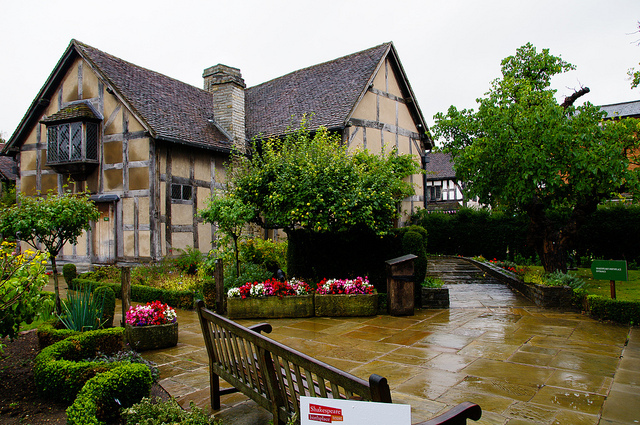 Mary Arden was Shakespeare’s mother, and as part of your trip to Stratford upon Avon you can visit the beautiful farm where she grew up. It functions as a working Tudor farm where you can learn about life in the time of Shakespeare’s parents and grandparents. On your visit you’ll get the chance to try out traditional crafts and skills, take part in activities like tending animals and even see the exciting daily falconry displays. One of the biggest highlights in the Stratford upon Avon calendar is the annual Shakespeare’s birthday celebrations. Every year in April the town comes alive with special birthday events and an incredible parade through the streets of Stratford. The 2014 celebrations will mark Shakespeare’s 450th birthday, so expect some extra special plans to be announced nearer the time. The celebrations always take place for two days on the weekend that falls closest to Shakespeare’s actual birthday on 23rd April, and it’s a not to be missed event for any big Shakespeare fans.